ovarian drilling – In women with PCOS ovulation doesn’t occur regularly and usually they have ovaries with a thick outer layer. The ovaries make more testosterone, the male type of hormone. High testosterone levels lead to irregular menstrual periods, acne, and extra body hair. 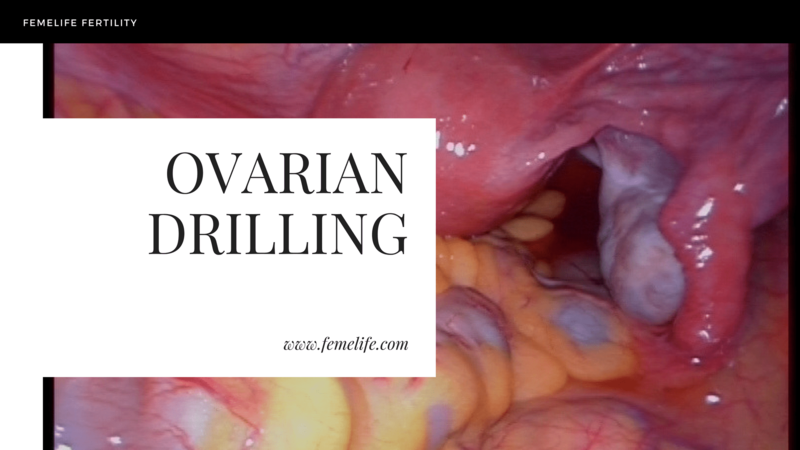 How drilling of ovary is done? A minimally invasive surgery called laparoscopy is used for ovarian drilling. A thin, lighted telescope (laparoscope) is put through a small surgical cut (incision) near the umbilicus. A tiny camera is used to see the ovaries. The surgeon inserts tools through other tiny incisions in the lower belly and makes very small holes in the ovaries. This helps to lower the amount of testosterone made by the ovaries. What are the benefits of drilling ovary? About 50% of women get pregnant in the first year after surgery. Some women still may not have regular cycles after the surgery. Others may have other fertility problems (such as blocked tubes or a low sperm count) that can prevent pregnancy. Some women after a short period of regular ovulation may go back to previous irregular cycles. For some women with PCOS, ovarian drilling will not fix the problems with irregular periods and ovulation, even temporarily. However, ovarian drilling can help a woman respond better to fertility medicines. What are the risks of drilling ovary ? There are certain risks of the surgery done for ovarian drilling . Some of the risks are related to surgery. As with all surgical procedures, there are risks of bleeding, anaesthesia, and infection. Also, laparoscopy can cause injury to the bowel, bladder, and blood vessels. Very rarely, there is a risk of death. There are also risks to fertility. If there is too much damage to the ovary during the ovarian drilling procedure, a woman may enter menopause at a younger age than expected. After the procedure, adhesions (scarring) can form between the ovaries and the fallopian tubes, making it hard to get pregnant. Most important in many women the beneficial effects are for too short period and they immediately go back to the previous status.